As I reflect on my race and entire experience at the 118th Boston Marathon, I not only take satisfaction in my personal result, but what we as American distance runners and as a running community at large were able to achieve on Marathon Monday. In every sense, we played our roles in taking back Patriots’ Day with resilience and panache. My road to Boston began at the end of 2013 in the same manner as the iconic race course: a rapid, pummeling descent along a byzantine roadway with only a vague idea of a finish line. In November my morale had taken a plummet from August’s high point– the Moscow World Championship— after a debacle of a performance at the ING New York City Marathon. Hoping for a breakthrough in my home state, I soldiered on through headwinds to a momentum-changing defeat. Still, I knew well enough from past experiences how to handle my profession’s undulations and keep myself level on course. 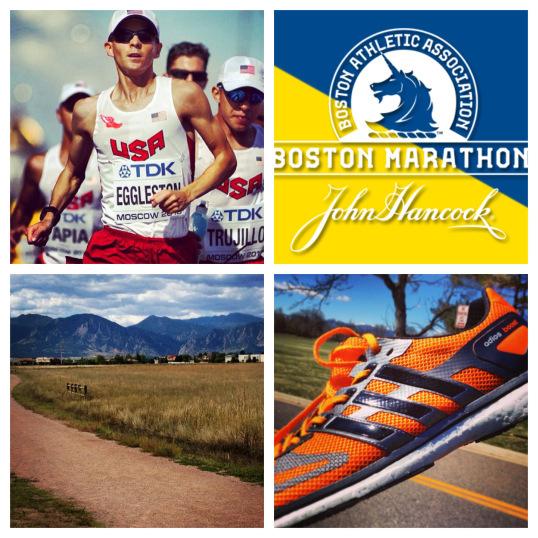 When the opportunity to run Boston was presented, it enabled me to refocus with a new carrot to chase. I was thankful to have an offer to run and felt that it was the right race selection at this juncture in my career: I need to play in the Majors. Whereas another athlete in my position might look for a venue to race the clock, I felt going mano-a-mano in another championship-style marathon was the better choice and would give me a chance to make more of an impact in the race. Given how athletes are forced to make decisions “on the fly” without pacemakers, I also think there’s a steeper learning curve in such competitions. I should also mention briefly that I felt running Boston a year after the 2013 tragedies would be a great way to be a part of the Boston Strong movement in a display of solidarity for the community and our sport. Without hesitation, I committed myself to April’s penultimate Monday race. And so I set off. My five-month buildup to Boston featured some competitive checkpoints along the way– akin to the towns that are strung together on the Marathon’s race course necklace. My first destination was Houston, where I had hoped to compete in the U.S. Half-Marathon Championship. Unfortunately, I became very sick from the flu in the first week of January. After 8 days of bed rest I withdrew from competing in Houston, but decided I would try to pace a portion of the marathon as practice. Along with 2 other Ethiopian pacemakers, I assisted Bazu Worku with a course record attempt and successful title repeat, leading the group through halfway in 1:03:15. I was happy with how controlled and low-key my run was. Even though it was a volunteer assignment, I was grateful for the opportunity to get some experience running at the front of a marathon and at a quality pace. My next stop came a few weeks later in Japan, at the Kagawa Marugame International Half-Marathon. In a deep field of corporate runners, I spent the entire 21.1km jockeying for position and came away with a 1:03:00 PB. I was pleased with how quickly I had regained my health and fitness and took this momentum back stateside to continue my Boston preparations. My other two outings served as escapes from the Colorado winter’s tumult. I ran a 1:04 half-marathon in Tampa and another 1:03 at the NYC Half. Both performances were solid enough for me, but marathon training remained my top priority and proved to be my biggest opponent while out there competing. After racing in New York, I traveled up to Boston to do a course reconnaissance. Over three days, I ran the entire course with the assistance of the John Hancock Athlete Recruiter. “It’s Boston, so expect anything!” I was told. I brought those words and my newfound knowledge of the course back with me to Boulder to strategize during my final month of training. When it was finally time to depart for the race weekend, I was relieved. I had trained very well, remained healthy and felt poised for a good performance. As the 24th seed, I had nowhere to go but up! Hopkinton was a far different atmosphere than when I had embarked from town on St. Patrick’s Day for my first course preview run. The overwhelmingly large crowds of onlookers were only a preface to the boost I would receive from an estimated 1 million spectators along the route. The start was exactly how I had envisioned it: we were sent off with a huge release of energy as gravity pulled us from the starting line and sent us hurtling recklessly down Route 135. Tuck and roll. There weren’t any surprises in the largely downhill first 4 miles. I stuck to my pre-race plan and tucked in with the lead group through some very tame low 4:50 miles (just over 3:00/km). My orange adidas Adios Boost flats helped cushion the landing shock. Our pack was close to 30 athletes strong as we passed the 5km en masse around 15:10 and rolled by the Ashland Clock Tower. I bided my time towards the back and remained a face in the crowd, notably among race favorites Dennis Kimetto and Wilson Chebet of Kenya. Meanwhile, our entire U.S. London Olympic Team– Ryan Hall, Meb Keflezighi (also a teammate for the New York Athletic Club) and Abdi Abdirahman— helped sustain an honest pace at the front. As known frontrunners, this seemed status quo to me. Our large group remained entirely in tact through Framingham as we approached the Train Depot at 10km in 30:30, only splicing momentarily to retrieve our personal bottles off of the special fluids tables. There were some minor traffic jams, although I had no problem grabbing my bottle of Lemon-Lime PowerBar Perform sports drink. Our chase pack warily came through 15km in 45:57, about 10 seconds behind the leading American duo. Ryan remained dawdling at the front and was joined by our compatriot Nick Arciniaga. The disorganization of our group continued as we approached the fluid station and 2:05 man Tilahun Regassa seemingly tangled with last year’s runner-up, Micah Kogo, and went down hard in front of me. I jumped over the tumbled Ethiopian and zig-zagged to grab my bottle. What an occupational hazard! Our group reestablished with ease due to the relaxed pace, as we followed a slight rise into Natick Center. I observed how quickly and significantly the gap was growing ahead. Still, all the favorites were content to watch each other (and not Meb or JB). Personally, I did not feel threatened by the early break. If defending champion Lelisa Desisa didn’t care about the gap, then why should I? Having watched several years’ worth of Marathon race footage, I knew historically that 10 miles in was not a good time to be noticed in the race. From my vantage point, the next 5km became more of a cat-and-mouse hunt. Unfortunately, I cannot confirm that there was any strategic American teamwork employed to enhance Meb’s growing margin. There certainly wasn’t any plan for this that I was made aware of. I do recall Ryan verbally communicating something to either Nick or fellow Boulderite Jason Hartmann, but I had assumed he was encouraging one of them to assist him with jumpstarting the group. At this time I noted alarmingly on my wristwatch that our 17th kilometer was covered in over 3:30! I’m not sure who was responsible for the slowdown. At the back of the group, there was some audible chatter among the Ethiopians. I couldn’t know if they were discussing the slow pace or Regassa’s fall. Gebre Gebremariam disappeared shortly after that. Finally, a strong move was made before the 20km mark– neither from an American nor an African. Surprisingly, the charge came from Vitaliy Shafar, a 2:11 marathoner from Ukraine. He had caught up to our chase pack and his injection of pace did considerable damage. Kimetto, Kogo, Desisa, Regassa and Markos Geneti were among the first responders. I was caught off guard by the acceleration and forced to claw my way back, encouraging Ryan as I passed him to come with me. At that point, any attempt to communicate was useless as we had entered the tunnel of screaming coeds at Wellesley College. I crossed 20km in 1:01:45, with some ground to close on the strung out chase pack ahead. In my estimation, Meb and JB had at least a 200m cushion on their pursuers. I entered Wellesley Center having lost more ground to the chase pack. Using his downhill prowess, Nick had caught up and led me by virtual tow rope on the downgrading slope. We passed through half-marathon in an unremarkable 1:05:05. I couldn’t help feeling some disappointment in myself for having let the pace slow down. About 10 seconds ahead, Geneti’s green and red Ethiopian national team uniform was visible at the front of the streamlined chase group. Still a lot of race left. It was extremely helpful to key off of Nick. We worked together to pull back some time on the select group of 10 or so. It appeared that the unheralded Shafar had again attempted to pull away. The pack didn’t seem to bite his hook, so they remained in striking distance for us. By 25km (1:17:04), our return to the pack was imminent. I did my best to stay with Nick as we made our descent into Lower Newton Falls. It reminded me of our time training together while a part of the Hansons Team in 2008. I remembered how exceptionally effortless he made downhill running seem during his training block for Boston that year (he would go on to finish 10th). Later on in 2012, fresh off my 2:12 in Chicago, I assisted him with some rolling 4 mile repeats on Lake Mary Road in Flagstaff and found myself trailing anytime the road dipped. We had trained and raced against each other enough through the years to know one another’s strengths. I respected his “go for it” attitude. On this day, our strengths complemented each other and so we worked as colleagues. At the 16 mile mark, we had caught back up to the group. I knew the race would get interesting with the road rising through Newton over the next 8km. It forced me to settle into my own rhythm during the climbs. I had passed by Regassa and a laboring Desisa before crossing over the I-95, and could make out the faint orange adidas vests of Lusapho April and Chebet stretching the group in pursuit of Shafar— perhaps also in their own hasty personal bids for victory. My plan was to keep it steady on the first two Newton Hills, and start a push at the crest of Heartbreak Hill. I held my ground on the group from the Newton Fire Station to the top of the first hill. The road leveled out and I recouped for the next mile, passing 30km in 1:32:49. A PowerGel taped to my 30km bottle had a rejuvenating effect. The second hill came as anticipated in 2 parts. I moved by the faltering Moroccan, Adil Annani and set my sights on the others who just disappeared around a bend on Commonwealth Avenue. I still felt in control and confident that I could run strong up Heartbreak. Crowds 3 or 4 deep formed yet another scream tunnel on the 600m, 4.5% rise. It was a spectacle that might resemble a haute catagorie climb in the Tour de France. People shouted for me while I solemnly concentrated on the road ahead. As a diversion, I read runners’ names and phrases of encouragement that were chalked all along on the tarmac. I pushed hard down the backside of Heartbreak and through Boston College, hoping I could make up several places on the mostly downhill run into the city. I crossed 35km in 1:48:48. Unbeknownst to me, Chebet was now in full-flight entering Brookline and eating away at Meb’s lead. The downhill coming into Cleveland Circle was particularly debilitating to my overexerted quadriceps. As I passed by April, I remembered how well I had conditioned my legs for downhill running in Boulder with Ali’s help, as she would drive me from the finish of my 3km repeats back to the start above. Despite a feeling of overexertion, I continued to pull back the runners floating ahead of me. From Coolidge Corner to Kenmore Square, I reeled in the Claudio Berardelli-trained darkhorse, Paul Lonyangata, and an athlete in a hot pink uniform that I did not immediately recognize as JB. All the while, Nick was doing what he does best: barreling over the small rises and drops to make up ground (at 40km, he was only 3 seconds behind). With 1km to go, we dipped under Mass Ave and I lost a few steps. I did everything I could to hang on. The slight rise on the final turn from Hereford to Boylston might as well have been a canyon wall. With less than 600m to go I passed the Trader Joe’s that I had frequented in so many trips to the city, and more importantly where I had resolved to start my finishing kick. I was neither gaining nor losing ground on Nick, but made the effort to keep my legs turning over. I watched the clock counting up and kicked all the way through the finish line to ensure a sub 2:12 clocking. As we were escorted to the recovery area, my time and place were confirmed: 8th in 2:11:57. Not bad for a Boston rookie. We learned shortly after from Sara Hall that Meb had held on for the win in a personal best 2:08:37. I was both shocked and inspired. He ran his own race and it paid off. As I walk (or maybe hobble) away from Boston, I’m pleased for my highest finish in a Major, and even the small PB. Maybe someday a big personal best time will happen for me. As Meb so aptly demonstrates, I could potentially have another 10 years of improvement in the sport with the right long-term approach. For now, I will continue to hone in on my racing skills and get consistent training in from year to year. Sky’s the limit.